Hyperpigmentation occurs when excess melanin causes a darkened appearance to the skin in either small or large areas. Pigmentation is the natural color of a person’s skin and it is related to melanin production. Melanin protects skin cells and their DNA by absorbing the sun’s ultraviolet rays (UVR). Darker skin types, in general, are more susceptible to hyperpigmentation than lighter skin types because their skin naturally contains more melanin. 1) UV induced: This type of hyperpigmentation shows in the form of freckles, age spots and uneven skin tone. It is caused by exposure to ultraviolet rays (UVR), whether from the sun or tanning beds. 2) Post-Inflammatory Hyperpigmentation (PIH): PIH is found in areas of the skin that have been subjected to inflammation due to trauma, acne or irritation (eg. fragrances or laser side effects). Inflammation stimulates Langerhans cells (immune cells), which alter the activity of melanocytes (skin cells), causing increased pigment production. 3) Melasma (chloasma): Melasma appears as symmetrical patches most often on the cheeks, chin, upper lip and forehead. It can be related to pregnancy, birth control pill, menopause or hormone replacement therapy. 1) Hyperpigmentation triggers eg. inflammation, UV rays, hormones. 2) Melanin production is stimulated within melanocytes. Tyrosinase is one of the key enzymes in this process. 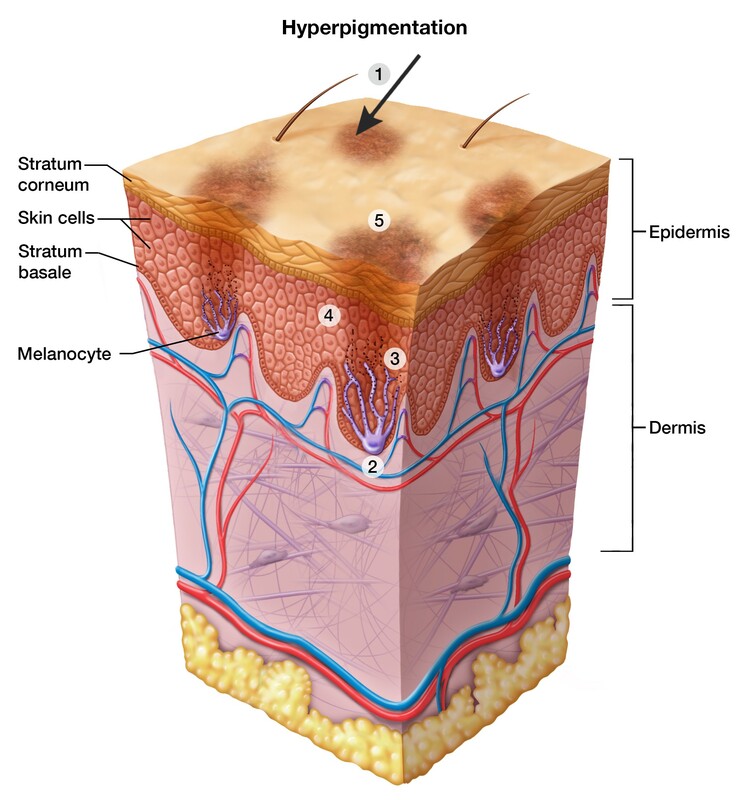 3) Melanin is transferred from melanocytes to skin cells. 4) Skin cells are in a constant state of upward motion to the surface. 5) Skin develops dark spots or patches on the surface or is uniformly darker (as in a tan). Hyperpigmentation can become darker as the skin cells move closer to the surface. This point is important because with many treatments, hyperpigmentation can darken in appearance before fading. Acne is the most common skin disorder in the United States, affecting 40 to 50 million Americans (source: aad.org). Almost 85% of all people develop acne at some point in their lives. Acne is a skin condition that consists of comedones, papules, pustules, and cysts. Acne most commonly develops on areas of the body that contain a lot of sebaceous glands (oil) glands like the face, neck, chest, back and shoulders. Acne usually begins (and is most common) at puberty, but many adults also develop the condition. 3) Proliferation of P. acnes bacteria and consequent inflammation. 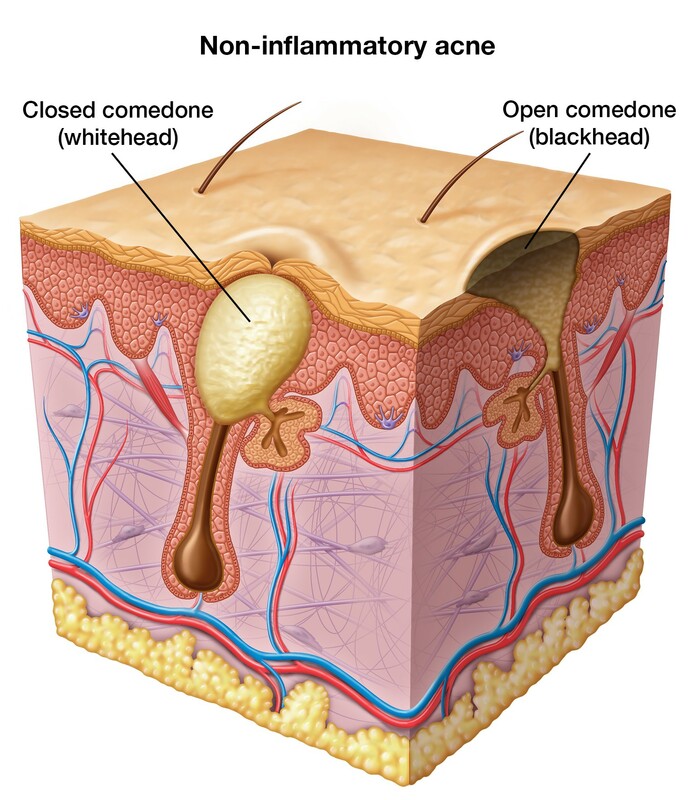 Blackheads and whiteheads (aka open and closed comedones) occur when a plug made up of sebum and dead skin cells can be seen inside a follicle (pore), but does not cause any inflammation or redness. Blackheads: If the plug enlarges and stretches the pore, it is referred to as a blackhead. Blackheads aren’t trapped dirt. Rather, the dark color is a build-up of melanin and oxidized oil. Whiteheads: When a thin cover of skin traps the plug, it prevents the oil from oxidizing. This keeps it white and creates a whitehead. 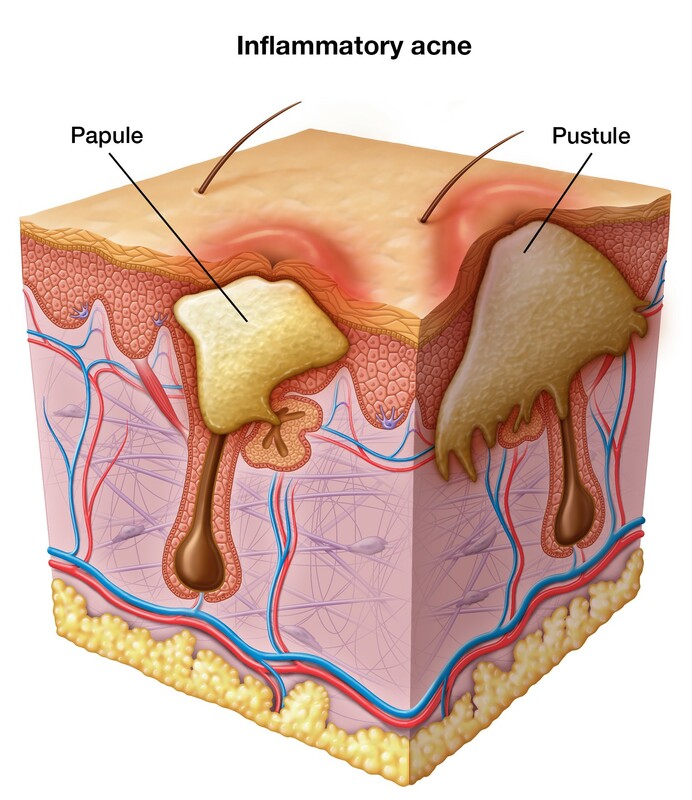 When follicles are blocked by sebum and skin cells, the follicular wall is under pressure. If the pressure is great enough, then the follicle wall will break and the contents will spread into the surrounding skin. When your immune system responds to this bacteria and sebum, inflammatory acne occurs. The degree of inflammation determines the size and redness of an acne lesion. Papules: Pink or red bumps without a white or yellow centre. Pustules: Red bumps with a white or yellow centre of pus. Pustules are formed when the plug inside a pore traps oil and bacteria, which draws white blood cells to the area to fight infection. Pus is made up of dead white blood cells. Cysts and nodules: Larger (and often painful) acne lesions that extend into the deeper skin layers. Cysts and nodules can last for months, destroy the follicle and lead to permanent scars. Individuals with this type of acne should see a dermatologist for treatment. Rosacea is a chronic skin condition characterized by facial flushing, redness, telangiectasias (visible vessels), bumps and pimples. The first sign of rosacea may be redness or flushing that comes and goes. Rosacea is most often seen in fair-skinned people between the ages of 30 and 50 and typically affects the cheeks, nose, forehead and chin. It is more common in women but more aggressive in men. The cause of rosacea is not yet certain; theories relate to bacteria that live in the colon, an allergy to a natural mite (demodex mite) that lives in our skin, unstable vessels, genetics and sun exposure. What we do know is that something irritates the skin, leading to chronic inflammation with intermittent flare-ups. If skin is sensitive or damaged, it will not cope with daily common daily aggressors. Sun, wind and pollution can cause a reaction within the skin. Since the skin is compromised and unable to properly protect itself from this reaction, the body sends blood to the areas as a defense mechanism. Blood brings oxygen by red blood cells and immunity with white blood cells to try and correct the effect of these aggressions. However, it also brings heat, redness and inflammation. If this flushing reaction occurs regularly over time, the blood vessels just under the skin will become dilated and the redness will be more permanent. As a result, the skin will become more vulnerable to daily aggressors and rosacea symptoms will get worse. Subtype 1: Characterized by flushing and persistent redness, and may also include visible vessels. Subtype 2: Characterized by persistent redness with transient bumps and pimples. Subtype 3: Characterized by skin thickening, often seen on the nose. Subtype 4: Characterized by dry eyes, tearing and burning, swollen eyelids, recurrent styes and potential loss of vision from corneal damage. Rosacea is a medical condition that should be diagnosed by a skin care professional before starting any treatment plan. Rosacea does not improve spontaneously and can worsen over time if left untreated. Individuals with a heightened intolerance to products and the environment are said to have sensitive skin. They may experience redness, discomfort, bumps and irritation. -Skin disorders like eczema or rosacea. -Overly dry skin due to a compromised hydrolipid barrier. -Overexposure to irritants like wind, sun and harsh topical ingredients. In all cases, the skin’s moisture barrier is impaired, which leads to dryness and irritation. Sebum (oil) is produced to protect our skin, making it waterproof and preventing it from becoming dry. Oil glands produce sebum that moves through the lining of each pore and then onto the skin’s surface. If overproduced, that oil mixes with dead skin cells in the pore and causes clogging and swelling. Large pores can also be a result of an aging skin. The production of collagen and elastin decreases with age and a loss of elasticity makes the pores appear larger. Gender and genetics are also factors. Men generally have larger pores than women, although hormonal fluctuations in females may contribute to enlarged pores. Oily skin is caused by the overproduction of sebum (oil) and is associated with acne (pimples), large pores, blackheads and a noticeable shine to the skin. Genetics and hormones play a key role in how much oil our skin produces. Dry skin is characterized by a lack of moisture and natural oils in the epidermis and can cause scaling, itching and fine lines. Dryness is usually related to a skin barrier issue that allows excess moisture to escape. This issue is referred to as increased transepidermal water loss (TEWL). 1) Winter weather: Cold temperatures and low humidity can dehydrate skin. 2) Aging: Hormone levels change as we age, leading to a decrease in sebum (oil) production and an increase in TEWL. 3) Genetics: Some individuals produce less sebum, causing them to have drier skin than others. 4) Hot showers: The longer you stay in the steamy shower, the more you dry out your skin. Five-minute is an ideal length of time. 5) Excessive exposure to water and harsh soaps: Frequent washing robs skin of moisture and many soaps strip skin of its natural oils. 6) The sun: Unprotected UV ray exposure disrupts the skin’s ability to balance moisture levels. Skin aging results from biological changes in the epidermis, dermis and hypodermis. In the epidermis, barrier function is reduced causing an increase in transepidermal water loss (TEWL). 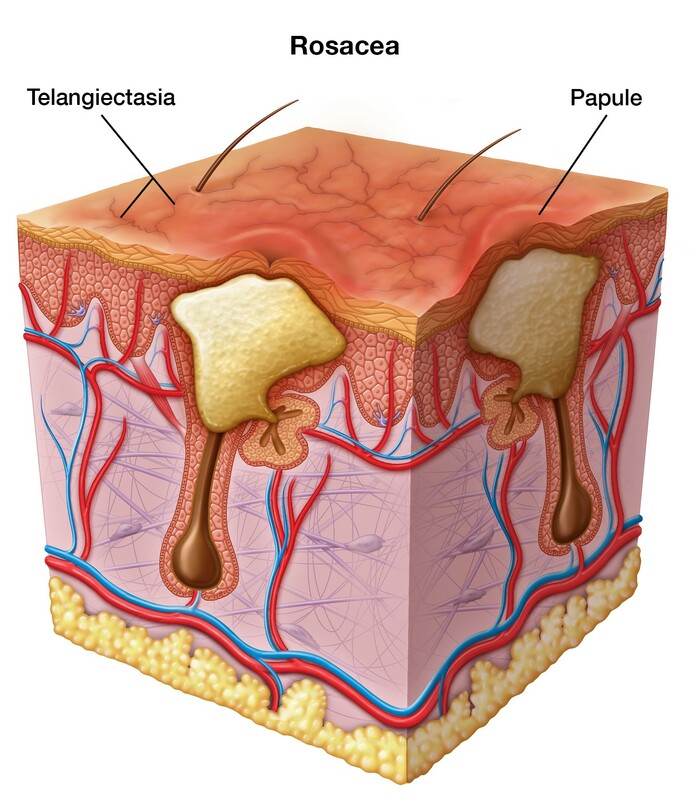 TEWL is the diffusion of water from the blood circulation through the dermis and epidermis finally to evaporate at the surface. Skin cell turnover slows and there are pigment production changes causing dryness and an uneven skin tone. In the dermis, collagen, elastin, and hyaluronic acid levels decrease leading to reduced firmness, elasticity and hydration. This results in fine lines, wrinkles, discoloration, dullness and decreased skin tone. Hypodermis aging is marked by the loss of fat in the face, which leads to decreased fullness, sagging skin and wrinkles. Aging of the skin can be divided into two categories: intrinsic and extrinsic. Intrinsic aging, known as natural or chronological aging, normally begins in our mid-20s and is determined by genetics. The good news is that you can reverse some of this damage and prevent future negative effects on the skin. What does aging skin look like?